The Pink Attitude Evolution is an annual event that celebrates “exceptional social, political, and economic achievements of ‘Game Changing’ South Asian women”. Last week, guests were invited to spend an evening at the Dreams Convention Centre to celebrate these modern day women that break down barriers and stereotypes based on age, gender, orientation, race, and religion. 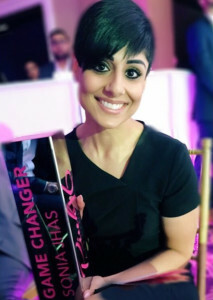 This year, renowned fitness expert Sonia Jhas (founder of Get Fit with Sonia) won the Game Changer award in the Health and Wellness category due to her positive impact on the topic and influence in the South Asian community. RELATED: Make Your Leg Workout Worth It! Jhas is a certified personal trainer and nutrition specialist. She has dedicated her time to understanding the balance that women face bouncing around from being too thin, too chunky, and back to thin. All of this is of course in the quest of trying to be healthy. This is something that Jhas has given a lot of thought to, especially when she looks at the cultural implications of what it means to be “feminine” in her community. A self-described “people person”, Jhas has reached her own fitness goal and relishes in the opportunity to help other women reach theirs. She has been featured on City Line, Glow Magazine, and The Huffington Post Canada. What’s The Beef Between Matt Damon And Jimmy Kimmel?